There are a mix of emotions at the moment. At a time when it seemed that the college landscape had settled, a new revelation has set in motion a new set of dominos that keeps the door open for even more moves. Maryland has been in talks throughout the weekend to make the expensive move to the B1G Ten, followed by Rutgers agreeing to follow suit. 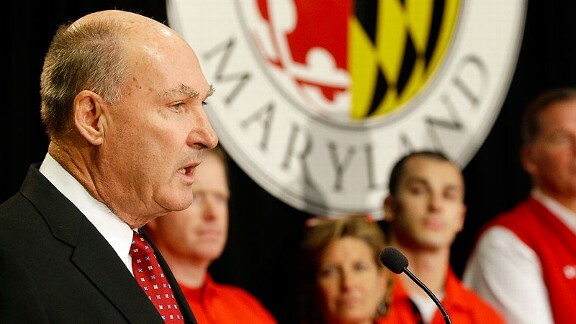 This afternoon, President Loh, Kevin Anderson, Jim Delany and the host of Maryland’s coaching staff stood before the media and announced that the decision had been approved by the Board of Regents and Maryland would officially joined the B1G Ten for the Fall 2014 season. Rutgers will be making their announcement on Tuesday. $$$$$$ – Maryland will receive a bigger television contract with the B1G Ten than they would ever get in the ACC. Enough said. Stability – The money is part of the equation. With the strapped for cash operations of the past few years, the program could start to turn attention from fundraising back to coaching and expanding. There is also the possibility of a continually changing realignment process and Maryland will at least have their position cemented. The Big East is definitely still in jeopardy and the ACC may also be less stable than it appears. The B1G Ten was looking for a market expansion, which it gets with UMD (Baltimore/DC) and Rutgers (NY/NJ), though how Rutgers is a big enough school is a little farfetched. New rivalries – The ACC’s realignment was going to create new challenges for Maryland’s matchups. The basketball schedule was going to eliminate the 2-game setups with UNC and Duke for Home & Home matchups with Virginia and Pittsburgh. Had Maryland been able to get one of the North Carolina schools and Syracuse, there may have been more they would be losing in the men’s basketball arena. Matching up with Indiana, Ohio State, Wisconsin, Michigan and Michigan State is not the same but also not as huge of a loss. At the same time, ACC football is not impressive, so the B1G Ten is a definite upgrade. Potential recovery of the program – In the past few years, the school has struggled with the threat to and eventual loss of multiple athletic programs. Recruiting – Tied into this is also the lack of strength in Maryland’s football program with the ACC. The lack of rivals and consistency in performance has hurt Maryland from attracting competition away from regional schools in other conferences and even other schools in the ACC. Stronger competition could open new doors for developing a stronger program. Tradition lost – Maryland was a founding member of the ACC. They have a history in all of their sports, particularly in basketball, soccer, lacrosse and field hockey. Men’s and women’s basketball against UNC and Duke are the biggest games of the year. While there is still opportunity to schedule early season matchups with these schools, nothing beats the ACC in excitement in college basketball. Loss of identity – While Maryland struggled to identify and gain foundational rivals in the ACC, they have always been an ACC school. The B1G Ten does not seem excited to welcome us in. Competitiveness – This is a problem on both sides. 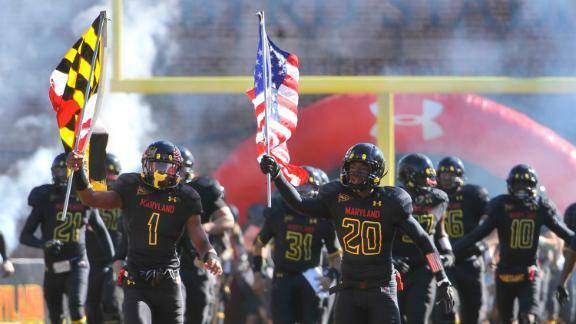 Football is significantly more talented in the B1G Ten, so it is difficult to understand how Maryland will be able to compete with the likes of Ohio State, Michigan, Wisconsin and Penn State. On the other hand, Maryland’s programs in women’s basketball, soccer and field hockey matchup so much better with the likes of UVA, UNC and Duke than the best of the B1G Ten. Maryland may come out a winner in those sports, but some nifty scheduling magic will have to take place to ensure that there are still matchups against the best the ACC has to offer. Lacrosse – The B1G Ten does not have lacrosse and Maryland boasts one of the best programs in the nation. The ACC will probably not be happy to entertain that Maryland remains a member in just 1 sport. Will Maryland have to channel Notre Dame and become a Division 1 Independent to keep the program afloat? Image in question – Maryland has gone through several years of tough image problems. Debbie Yow and the administration during her leadership conducted some questionable financial management and business practices that put the school in a position to have to cut some longstanding and successful teams. When Kevin Anderson came in, he fired Ralph Friedgen and managed the dissolution of those unprofitable teams, cutting some marketable interest from prospective students. This move came out as a surprise without any significant public discussion more than days before the official announcement. This raises questions as to why the move took place in he public eye so quickly and will the school be looking at some interesting investigations in the near future that uncover the shady business practices that led to this move? Is Maryland being used? – The B1G Ten’s motivation is clear ($$$$$$). What about Under Armour? Kevin Plank is strongly for this deal because it opens him up to an entirely new market that is not challenged by Nike with the strong UNC connection. Maryland could be collateral damage for an attempt at a new market. Expansion of certain programs – The B1G Ten would certainly get a boost from the addition of Maryland lacrosse (if they can get up to 6 teams for an automatic bid), soccer and field hockey. Maryland basketball also has a great history and would add a little something to the conference. Continued drama for the Big East – As another team prepares to leave the Big East, the conference is scrambling to keep its current members. Pitt, Syracuse and Rutgers are all dodging for the ACC. UConn could be right behind them. It is only a matter of time that Louisville and Cincinnati wise up to maintain competitiveness in football. The new additions are also going to start having second thoughts due to the lack of strength of the conference and the ridiculous travel schedule. It will not take long for San Diego State, Houston, Boise State and SMU to also wise up and find their way into more regional conference that make sense. Continued realignment to SUPER conferences – Louisville and Cincinnati would be strong candidates to take the B1G Ten up to 16 teams. Notre Dame could also decide that they are a better fit for the B1G Ten and jump the ACC ship, causing one of the other teams to go ACC. SDSU and Boise State would probably go to the Pac-12. Houston and SMU would fit in with the competitiveness of the Big 12. South Florida, Memphis, Temple and UCF could be the odd schools out, as the SEC has shown no interest in taking on more Florida teams (and they would want more competitiveness from the likes of FSU or Miami over South Florida and UCF). SUPER conferences to the extreme – Even the ACC could be in trouble with these continued moves. There have been thoughts that UNC would make an eventual strong addition to the B1G Ten structure, and Kansas also is a member of the Association of American Universities (which is a prerequisite for the B1G Ten). The ACC could follow the pattern of the Big East, losing North Carolina teams to the B1G Ten and/or Big 12. FSU, Miami, Georgia Tech and Clemson would go south to the SEC. Boston College, Syracuse, Pitt and the Virginia schools would have a tough sell to figure out which conference they fit into, but the B1G Ten would make the most sense regionally.